I was raised in a church that emphasized regular Sunday attendance, Bible reading, and rules. My teenage years were focused on challenging the rules, which created an inner conflict of remorse and shame when my behavior collided with my values. I dealt with my guilt through numerous “back to Jesus” experiences, but I kept backsliding. My weekend binge drinking caused me to drop out of university. My parents hoped a stint at a Bible school might straighten me out. During my time at the school, I abandoned my drinking friends, met my wife, and settled down to raise a family. We became active members in our Mennonite church, involved in youth work and music. My job, however, introduced me to a circle of friends and a work environment that pressured me to drink to fit in. . . . I was one person during the week and another on Sundays. I became alcoholic. The Close to Home series is designed to help Christian caregivers invite others to journey toward wholeness. * Offer them and discuss them in your pastoral care visits. 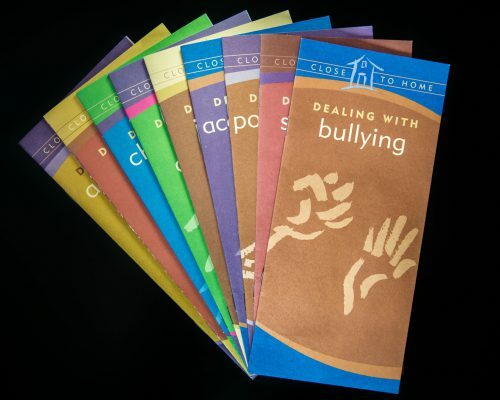 * Display them in the church foyer, counseling office, or even a restroom. * Give them to loved ones of those who suffer, so that they can be informed. * Distribute them as conversation-starters for adult education or support groups. Be the first to review “Dealing With Alcoholism” Click here to cancel reply.